Three activities kids enjoy the most are making noise, art and spending time with a parent. One way you can incorporate all three activities into one is by making musical instruments at home. Besides the obvious benefits of keeping the kids occupied and happy, you will be helping them develop greater small motor skills, develop creativity and improve hand-eye coordination. You don’t need anything fancy. In fact, you probably have most of the materials already if you keep art material on hand. In each of the activities below, your child will be able to do most of the assembly. Adult help with the hot glue gun and stapler will be necessary, but other than that, helping will be based on the age and skill of each child. Let’s get ready to have some fun! Make sure the lid is securely fastened to the container and then allow your child to paint and decorate the container. He can use either a wooden spoon or his hands to drum on it when it is done. 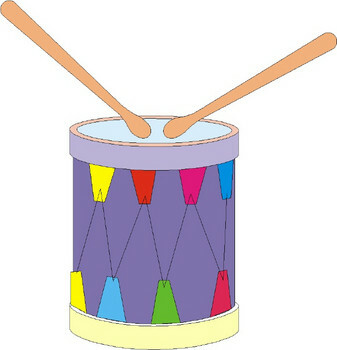 Show him how it makes different sounds depending on whether it is hit on the edge or center. Remove the top from the shoebox as you won’t need it. Have your child decorate the box. When it is dry, stretch the rubber bands around the box lengthwise. Glue the ruler to the bottom of the box to make the arm of the guitar. Start by cutting one inch of the first straw, two off the second, and so on. Have your child start with the longest straw on her left. Using a thin line of glue, glue the next longest straw on the right and continue, with the straws getting smaller. Once all the straws are connected, wrap two pieces of ribbon around the straws near the even end and glue in place. Let dry. Paint the paper towel roll and allow to dry. If you want more decorations, put them on and then glue one of the construction paper circles to one end of the tube. Fill the tube with rice and glue the second paper circle over the open end. Let the glue dry. Decorate the bottom of both plates. Place them with tops facing and punch holes about every two inches. Thread twistie ties through the bells and then through the holes in both plates. Have the little ones give a concert!